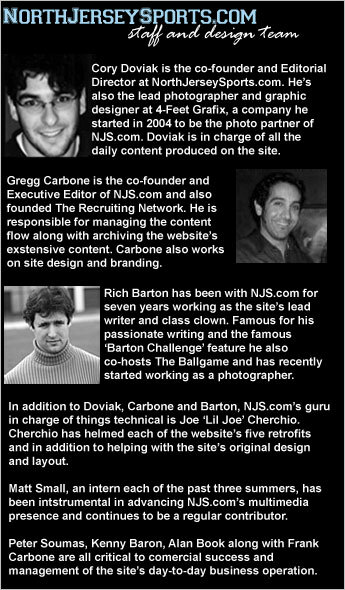 Northjerseysports.com was established by local journalists in early 1999 with one simple goal in mind — to provide local sports in North Jersey the coverage it deserves, and used to get, before the local media outlets turned their attention toward professional sports. Simply covering local sports, especially high school sports, isn't all NorthJerseySports.com to do. We wanted to involve the local sports community. So the task of networking all North Jersey's (Bergen, Hudson and Passaic counties) high schools, each fitted with its own page began. The idea to allow student and faculty involvement in the production of content for each school page gives NorthJerseySports.com the unprecedented ability to provide comprehensive and in-depth coverage of the local sports scene. The site is divided into three sections — the home page; separate pages for each sport and individual school pages where students and teachers will have the freedom to be creative in representing their teams. The home page has a newspaper feel to it with contributed stories from the NorthJerseySports.com staff. Reporters are dispatched to various games and the site is updated every night — no waiting for the morning paper. The home page is where polls are conducted, site updates are displayed and where navigation of NorthJerseySports.com begins. Don’t care much for football? The sports pages are one-sport specific. This is where only articles pertaining to your sport of choice are displayed and where past articles will be held before being archived. Each school is provided with its own page where information such as schedules, directions to playing fields and rosters can be found. From there, it is up to the individual institutions to provide the public with information regarding its teams. Students can write features, columns and game stories or simply provide results and statistics. With new schools getting online with NorthJerseySports.com everyday, in addition to coverage of other local sports activity, North Jersey's sports are going to have blanket coverage like never before. Professional and student journalists alike cover everything from bowling to basketball, football to fencing and swimming to soccer, with no limitations.